Buy Ritchies Airlock 1 single online from our UK Homebrew Shop. We sell Airlocks (Bubbler) - 1 piece and other genuine Ritchies products in the UK. 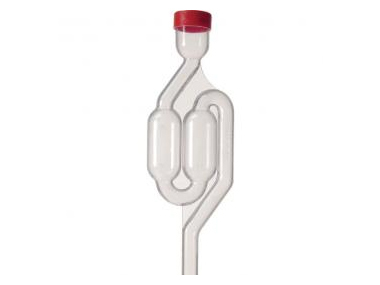 Use this airlock, also known as bubbler, in a 1 gallon glass demijohn. For making wine at home! Can be used with a bored rubber bung or with a cork one. Simple to use airlock/bubbler with bored bung. Use in a 1 gallon glass demijohn, simply insert airlock in bung, fill with water and let the magic begin! Where to buy Ritchies Airlock 1 single safely online? Shop at the Stirling Homebrew Shop if you are wondering where you can buy Airlocks (Bubbler) - 1 piece safely online in the United Kingdom. Airlock 1 single - Airlocks (Bubbler) - 1 piece in Homebrew Accessories and Homebrew.